Safe for use as eyeliner, lipstick, and cream eyeshadow, this multi-use mixing base transforms any cosmetic-grade powder into your own makeup creation. It will create a long-lasting, water-resistant product which will dry to a matte finish if flat pigments are used, or semi-matte (matte-metallic) if shimmery powders are mixed in. It also works with fine cosmetic-grade glitters. The product has a somewhat thick consistency, and may require slight shaking before use. Off-white but dries completely clear. 5.8ml, comes with a small mixing spatula. The bottle appears small, but will be enough for quite a few applications. 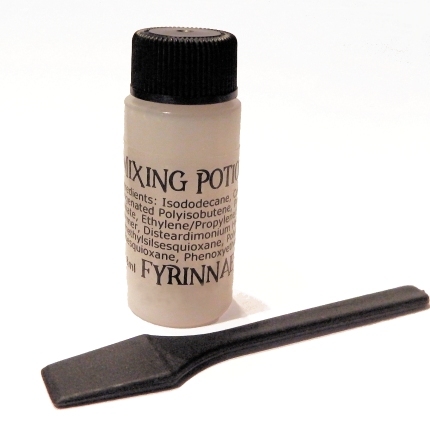 Directions: On a clean surface, such as a small jar or mixing palette, mix a very small amount of the base with the colorant powder or loose eye shadow of your choice. Be sure if it is intended for eye product use, it is eye safe, and lip-safe if used as a lipstick color. The more colorant you mix in, the bolder the color product will be, and the longer it will last when worn. Try a 1:1 ratio at first. We recommend only mixing what you wish to use at the time, but small amounts of mixed product may be stored in an airtight container for future use. Removable with oil or an oil-based makeup remover. This is not a primer, and while dry ingredients may stick to it before it dries, pre-mixing will give the best results and far less fallout, if any. Ingredients: Isododecane, Ceresin, Hydrogenated Polyisobutene, Propylene Carbonate, Ethylene/Propylene/Styrene Copolymer, Disteardimonium Hectorite, Polymethylsilsesquioxane, Polypropyl Silsesquioxane, Phenoxyethanol. Fyrinnae is not responsible for the result of your mixed products. While the base itself is safe for all applications listed, please ensure the colorants you use are safe for lips or eye area use.